The HLSCC Virgin Gorda Centre had lost its projectors, among other equipment, during the devastating hurricanes of September 2017. 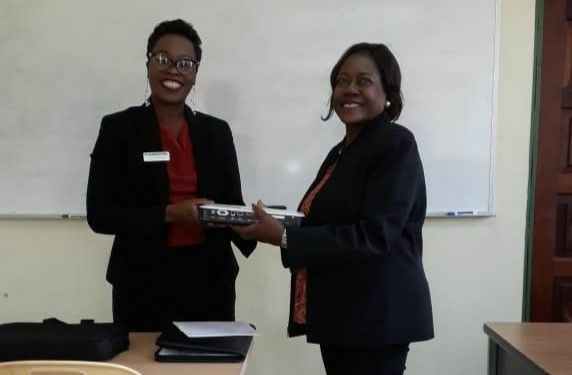 The donation is but one act of ‘community mindedness’ by Nagico Insurances, since as recently as January, it donated a dozen of the recently launched book titled, “Nursing In The Virgin Islands: A Historical Perspective (1920-2017)” to HLSCC in Paraquita Bay. The book was the work of local author and medical professional Norma M. Benjamin. “And we were delighted to be given an opportunity by Dr Steve Leonard, to make a presentation to the HLSCC’s Virgin Gorda Centre…We trust this piece of equipment, an EPSON PowerLite Wireless Projector, would assist the college to creatively deliver some of the programmes offered,” Ms Ophelia said. On hand to receive the donation was HLSCC's President, Mrs Judith E. Vanterpool, who expressed gratitude for the continued support by Nagico Insurances. Director of the HLSCC Virgin Gorda Centre, Dr Steve Leonard also expressed words of appreciation for the needed equipment. “We lost all the projectors we had during the hurricanes. We would normally use them for business classes, computer courses and so on…Our IT guys are very excited about it as well. It is a very good brand,” Dr Leonard stated. insurance payments gone up so nice to see this group contributing to community concerns: one also hope the cost dental care will soon drop.keep the faith people!!!!! A gift from the devil is a gift worth nothing.